Today Nick K and I decided to do one long dive at our favourite local dive spot Julian Rocks in Northern NSW, Australia. 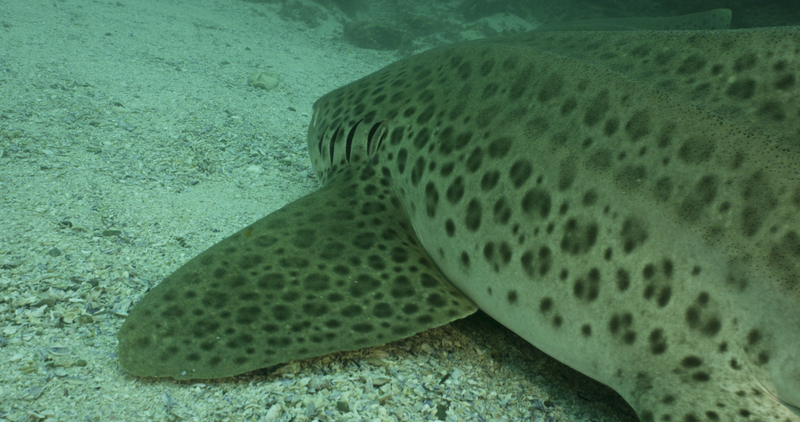 We had missed most of Summer diving here due to a few overseas dive trips, and I was eager to get some footage of the Zebra Sharks more commonly known as Leopard Sharks locally, before they moved out to warmer waters. We headed to the Needles and the Aquarium which is a name we gave it last Summer due to the dense amount of fish life and Leopard sharks swirling around in one spot. As we were doing a long dive we decided to wait half an hour for after everyone got in, our strategy being to have the spot all to ourselves as three other boats descended upon the site. The visibility was milky and ranged from 5-10 metres with quite a bit of swell and some surge, although no current. I thought welcome back to diving in Australia, no 50 metre visibility at this dive site! We didn’t see anything out of the ordinary for about 25 minutes and were starting to think the other boats had scared the everything away. But we waited patiently then all the animals started to come back, and as we had hoped we were the only ones there to enjoy it. We saw a Manta Ray with a school of fish trailing it and four huge Remoras underneath it, it hung around with us for about 15 minutes. 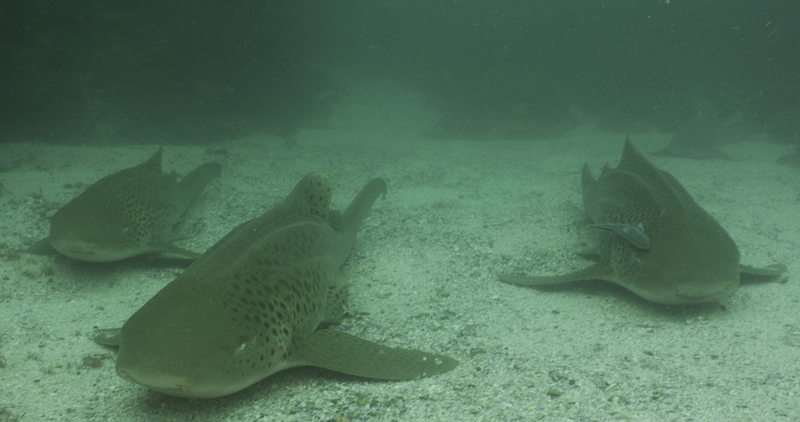 A dozen or more Leopard Sharks started to come back and swam around us. Lots of schools of Tropical fish including a huge Snapper, Mackeral and Barracuda swimming solo. The Manta Ray looked so miniature compared to the giant Pacific Manta Rays we recently dived with in Socorro. A huge black Bull Ray came towards me, and then, as if stunned by my lights hovered right in front of my camera for what seemed like ages before it swam just underneath me. A little unnerving as I strategically placed my camera between its barb and my body. We saw Green turtles and the big Loggerhead resident turtles, Flute fish and a Guitar shark. 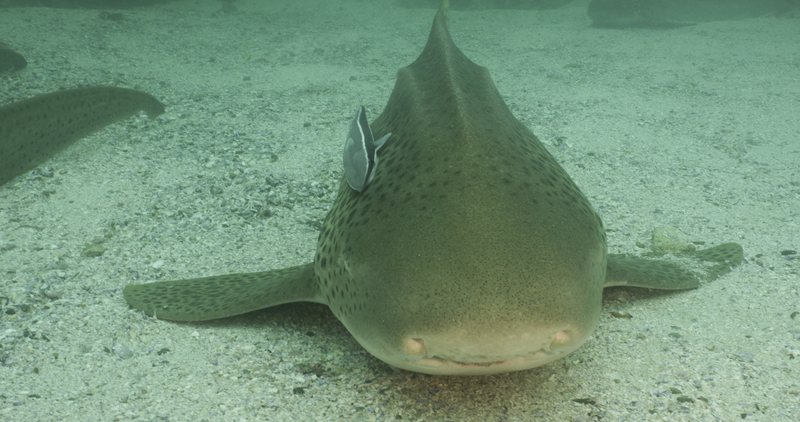 Nick found about eight Leopard Sharks having a rest on the sand and I thought super! as due to the visibility filming them swimming around wasn’t ideal unless I was very close to them. I snuck up to them on the sand and managed to position myself in between them all. Very gently I started filming them and they got pretty used to me. After half an hour of filming them I had one in front of me so close its tail was actually brushing against me in the surge and it really didn’t seem bothered. I was lucky enough to have the time to really frame some nice shots and even got in front of them and got some close footage of their cute puppy dog smiles. By this time it was 100 minutes into the dive and we still had a heap of gas left. I asked Nick if we should go up because we told Blue Bay we would be about 100 minutes. Nick had already seen Christina down there and so instead just shot an SMB up to signal to the boat we were ok and we continued on for another 20 minutes. By that time I had so much 4k footage of the Leopard Sharks my camera battery died and we saw a huge Sting Ray very close on the ascent. It was an absolute fantastic dive, we literally swam around a small area and saw it all! It just makes you realise how lucky you are to have a dive site like this as your local. I guess we take it for granted, we travel all over the world when we have some of the best diving right here on our doorsteps! Gotta love it! Looks great Anita. You are producing very professional work! !